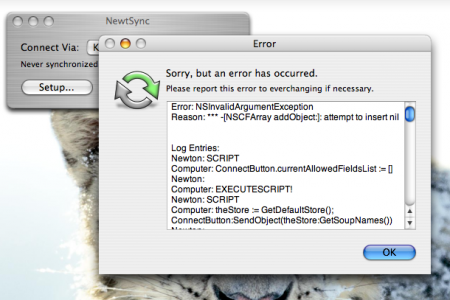 I can’t remember the specifics, but I seem to recall there being an issue related to NewtSync and contacts. 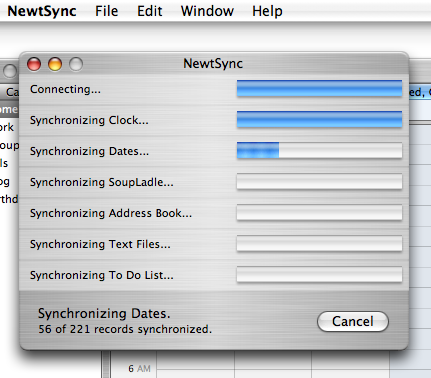 If there are long notes (over 100 characters) then NewtSync would crash. Removing the offending notes should resolve the issue. Also, make sure you have version 0.3.3 from http://www.thenowhereman.com/hacks/newton/ . If syncing contacts on a regular basis isn’t a big priority then you may want to look at Eckhart’s IC/VC program. I’ve exported my entire address book to a single vCard file and then transferred it to the Newton with no major problems. Posted by Gizmo on November 2nd, 2009. Thanks for the heads-up, Gizmo. I don’t usually put notes in any of my Address Book contacts. But the vCard file idea sounds like a good one, because no, I don’t update my contacts all that often, except when I add them. Posted by davelawrence8 on November 2nd, 2009.